Lately, on Pinterest, I have seen a lot of different ways to make monkey bread that depart from the typical gooey sugar and cinnamon syrup. One such recipe was Mini Garlic Monkey Bread over at Crumbs and Chaos. This recipe is simple enough and tastes pretty good, but, as usual, I took it up a notch and made spirals so that the flavoring spreads more evenly. Preheat oven to 400F. Grease a 12 cup muffin tin. In a small saucepan, melt the butter. Add the garlic and cook for 30 - 60 seconds. Remove from heat and stir in the parsley and Parmesan cheese. Set aside. Open the cans of crescent rolls and unroll the dough into a flat rectangle (or roll dough from scratch into a rectangle). Brush the dough with the butter mixture. Starting on one of the long sides, begin tightly rolling the dough. When you reach the end, pinch the seam shut. Using dental floss, cut slices about 1/2" to 1" thick. Place up to 3 slices in each of the muffin cups. If needed, brush the tops with more of the butter mixture. Bake for 12 - 14 minutes or until the edges are browned. Another great twist on this classic is Maple Bacon Monkey Bread. Just switch out the butter mixture here and replace it with the maple bacon mixture. Oh, and add about a 1/2 cup diced apples to the mix. SO GOOD! About a year ago, at a family get together, my nephew introduced me to the delightful taste of combining apple slices with cheese and crackers. It was so good, I have done it several times since. More recently, while enjoying a lovely cheese plate his mother put together, Jacob added pepperoni to the mix. I must say I don't really care for pepperoni, but in this combination I loved it! About a week later, when I was planning out my meals, I was inspired by that little combo to create this pizza. The dough is a cross between a baking powder biscuit and focaccia bread. The sweetness of the apples really calms the spicy of the pepperoni creating a wonderfully balanced mix of flavor. Try it out and tell me what you think! Preheat oven to 400F. Line a cookie sheet with parchment paper. Mix together the dry ingredients for the pizza dough. Make a well in the center and fill it with the oil and the water, then begin stirring with a wooden spoon until a ball forms. Add more water if the dough is dry or stiff. You should have a soft, not sticky dough. Place the dough on a floured surface and roll to about 1/2" thick. Place dough on cookie sheet. Brush dough with oil, then sprinkle with the parmesan cheese. Place the apples on the dough then layer them with the pepperoni. Sprinkle the pepperoni with the cheddar cheese. Bake for 15 - 25 minutes or until cheese is bubbling and the crust is browned. If you want to take your pizza to a new level, check out the Stuffed Pizza over at I Want Crazy. After releasing a few of the spats patterns, I had some requests for child and baby sizes. This got the wheels in my head spinning and this is one of the patterns I created. I also decided that the Tiny Spats patterns needed to have a matching headband. So, here you are; a lovely little spats pattern with a cute matching headband! I really feel like posting today, but I don't have a project to be posted. Sad story, I know, but alas, I figure I will share some of my favorite free flower tutorials. Please enjoy! Some time ago, while perusing Pinterest, I came across a crochet chart for a modern doily that I loved. I knew it had to be a rug for my daughter's room, but was stuck on what to make it out of. I put it to the back of my mind and started working on some Spats patterns, but that doily kept creeping into my mind and ended up inspiring me to create the Chevron Fancy Spats. Once that was complete, I kept thinking of this doily becoming a rug. So I started to research materials that I could use/afford to make it with, when I came across a rug made of old sheets. I have seen rag rugs before and not thought much of them, but this one wasn't braided, it was crocheted. A light bulb went off, I packed my little one into the car and headed for the thrift store. I bought a set of pale green, jersey, king sized sheets and began cutting/ripping 2" strips. Below is the end product. 1. I pretty much followed the chart for this pattern, however, instead of doing DCS for every row, I did SCS for one row, then DCS for the next row because I was concerned about running out of yarn. 1. I did not test different strip width sizes, I just started tearing at about 2" wide, then tried to make sure that all of the strips were approximately the same width. 3. A note about the fabric, keep in mind that the back of the fabric will show up too. The sheets I used (and most sheets) were the same on the back and the front which is how I was able to get a solid colored rug. 4. Plan on taking brakes. My right arm would get pretty tired. 5. Some of the sites I looked at for tutorials have you cutting a slit in one strip then pulling the next strip through to connect them, but I just tied my strips together and wound them into a HUGE ball. While I was crocheting, I made a point of pushing the knots to the back side so that I wouldn't have to weave them in. 6. When I finished the rug, it didn't lay completely flat so I took the tops off my storage ottomans and placed them on it so it would flatten out, which worked great. This seemed to be a typical problem on most of the blogs that I read about using sheets for a rug. I would suggest at least putting books or something on top or, if you can, block the final product. My Fancy #Spats patterns have been primarily crochet, but fear not knitters, I bring you Liana. It is a simple, lacey vine stitch that is easy to memorize. It comes in one size, which is approximately 11 1/2" around the ankle and 2 1/2" tall. As with most of my patterns, I used Caron Simply Soft for this pattern, but you can use any lightweight worsted yarn. It's a quick, fun knit and the end product adds such a fun frilly detail to the top of shoes. Here are some items that I recently added to my Etsy Shop. Click on the picture to link to the listing. I love the #broomsticklace stitch. It is so easy and quick to do, furthermore, with this pattern, it couldn't be simpler. Basically, this headband just stacks the stitches, so you can make it whatever length you like. There isn't a gauge so you can use whatever size hook you want and whatever size stick to create the stitch. Please enjoy! Oh, and don't forget to enter the #Giveaway, only 3 days left until it ends! The name of the broomstick lace stitch comes from the fact that originally it was created using a broomstick. Basically all you need to create this stitch is a stick of some sort, however, most often, people employ a large knitting needle. When I have used a smaller crochet hook for the single crochets, I have used the end of a large crochet hook. Anything around the house will do (a tutorial on Repiny uses a Popsicle stick), just try out one stitch and see how you feel about the proportions. If you would like a video for this stitch, there is a great one by Sandra Roarty. Row 2: Pull the loop on your hook to make it big, then insert your stick into the loop, *insert your hook into the next stitch and pull up a loop, then put that loop onto the stitck, repeat from * with remaining 3sts. You should have 5 loops on your stick and no loops on your hook. Repeat rows 2 and 3 until you reach your desired length and bind off. Keep in mind that your yarn will probably stretch at least a little bit, so ending 1 or 2 stitches early wouldn't be the worst idea. Sew on button and weave in loose ends. 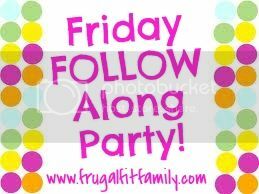 I shared this post on the Friday Follow Along over at Leah Inspired. 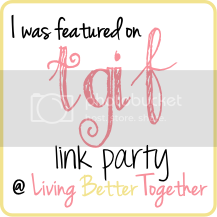 Those of you with blogs, link up and follow along and if you don't have a blog, just go check out the other great blogs linked up over there. I'm in a giving mood this week and thought it might be nice to share the love by doing a little raffle. Entering is simple, just click the button below! Also, be kind and comment on this post with a link to either your blog or your favorite blog. A week from now, you could be the proud owner of either a $20 gift certificate to my Etsy Shop or 3 of patterns of your choice from my Ravelry Shop. The winner will be randomly selected at 12:00 AM (EST) on Sunday July 14, 2013 and emailed the next day notifying them of their winnings. The winner will have 48 hours to respond with their choice of prize otherwise another entrant will be selected and given the same amount of time to respond.